The Rochester Knighthawks showed their mettle tonight as they rallied for the game’s final five goals, but fell 11-10 to the Colorado Mammoth at Pepsi Center. 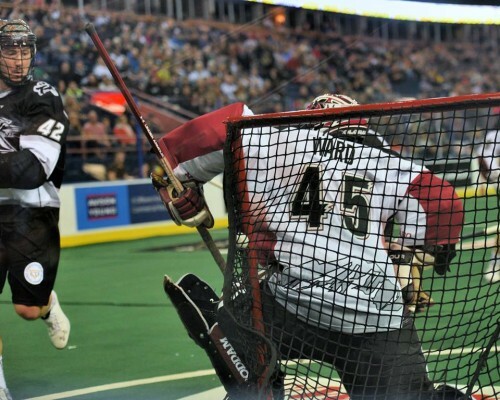 Dan Dawson led the way with one goal and seven assists, which allowed him to become only the sixth player in National Lacrosse League history to reach 700 career assists. Dawson was huge in the fourth quarter, assisting on four of Rochester’s goals. Jamieson also provided an offensive spark, netting all three of his goals in the fourth. His final goal came with just 26 seconds to play. Rochester trailed 11-5 early in the fourth, but fought back with four goals in just over a four-minute span to get within two. Joe Resetarits (2+2) scored on the power play to make it 11-7 and Dawson connected for Rochester’s second goal on a five-minute high-sticking major. Jamieson then reeled off two straight goals to get the Knighthawks within one. Rochester won the ensuing faceoff and called a timeout with just 17 seconds left in the game. The K-Hawks had one last chance, but the chance fell just short. The fourth-quarter rally, however, has Rochester eager to get back to work Saturday night. Evans aided the team with 18 faceoff wins and 13 loose balls. Jordan Hall finished the night with three points (1+2), while Joe Walters, Scott Self and Cory Vitarelli each had one goal. In goal, Matt Vinc finished the night with 38 saves. Rochester (10-5) can still clinch a home playoff game with a win Saturday night in Langley, BC. The Knighthawks will battle the Vancouver Stealth Saturday at 10:00 p.m. The game is on NLL LIVE in the U.S. and on TSN.ca in Canada. The radio broadcast will be available on 105.5 The Team and online at theteam.fm.